Researchers identify the precise trigger of melanoma. Skin cancer is the most common of all cancers, and melanoma, which accounts for 2% of skin cancer cases, is responsible for nearly all skin cancer deaths. Melanoma rates in the US have been rising rapidly over the last 30 years, and although scientists have managed to identify key risk factors, melanoma’s modus operandi has eluded the world of medical research. Now, a new study from researchers at Tel Aviv University and The Hebrew University of Jerusalem sheds light on the precise trigger that causes melanoma cancer cells to transform from non-invasive cells to invasive killer agents, pinpointing the precise place in the process where traveling cancer turns lethal. The opensource study is published in the journal Molecular Cell. Previous studies show that if melanoma is caught in time, it can be removed and the patient’s life saved. However, once melanoma invades the bloodstream, turning metastatic, an aggressive treatment must be applied. When and how the transformation into aggressive invasion took place was until now a mystery. The team explain that to understand melanoma they had to obtain a deep understanding about the structure and function of normal skin. They go on to add that melanoma is a cancer that originates in the epidermis, and in its aggressive form it will invade the dermis, a lower layer, where it eventually invades the bloodstream or lymph vessels, causing metastasis in other organs of the body. However, earlier studies show that before invading the dermis, melanoma cells surprisingly extend upward, then switch directions to invade. The researchers state that it occurred to them that there had to be a trigger in the microenvironment of the skin that made the melanoma cells invasive. After collecting samples of normal skin cells and melanoma cells from patients at hospitals around Israel, the lab mixed normal and cancerous cells and performed gene analysis expression to study the traveling cancer’s behaviour. The data findings showed that completely independently of any mutation acquisition, the microenvironment alone drove melanoma metastasis. The current study found that when melanoma is situated at the top layer, a trigger sends it down to the dermis and then further down to invade blood vessels. The team hypothesize that if they could stop it at the top layer, block it from invading the bloodstream, they could stop the progression of the cancer. The results showed that the direct contact of melanoma cells with the remote epidermal layer triggered an invasion via the activation of ‘Notch signaling,’ which turns on a set of genes that promotes changes in melanoma cells, rendering them invasive. According to the study, when a molecule expressed on a cell membrane, a spike on the surface of a cell, called a ligand, comes into contact with a melanoma cell, it triggers the transformation of melanoma into an invasive, lethal agent. The team state that the triggers of melanoma transformation are known and the kind of signalling that leads to that transformation, the medical community know what to block. They go on to add that there are many drugs in existence that can block the Notch signalling responsible for that transformation and that in the future people may be able to rub some substance on their skin as a prevention measure. For the present, the lab is continuing to explore the research with the end goal of providing medical professionals with another tool of analysis of different stages of melanoma. They surmise that melanoma is a cancer with a very long gestation period and conclude that if precise answers can be provided, the medical team can catch it at the beginning stage and hopefully save lives. The most critical stage in initiation of melanoma metastasis is the radial to vertical growth transition, yet the triggers of this transition remain elusive. We suggest that the microenvironment drives melanoma metastasis independently of mutation acquisition. 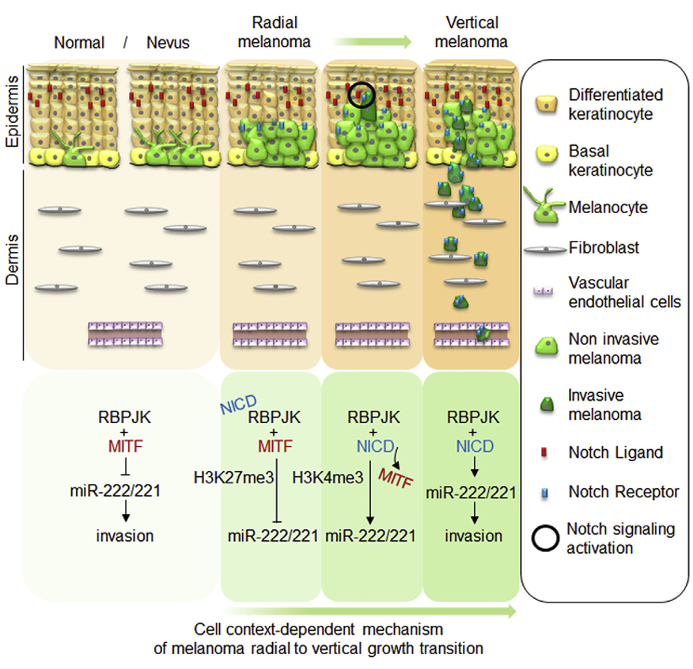 Here we examined the changes in microenvironment that occur during melanoma radial growth. We show that direct contact of melanoma cells with the remote epidermal layer triggers vertical invasion via Notch signaling activation, the latter serving to inhibit MITF function. Briefly, within the native Notch ligand-free microenvironment, MITF, the melanocyte lineage master regulator, binds and represses miR-222/221 promoter in an RBPJK-dependent manner. However, when radial growth brings melanoma cells into contact with distal differentiated keratinocytes that express Notch ligands, the activated Notch intracellular domain impairs MITF binding to miR-222/221 promoter. This de-repression of miR-222/221 expression triggers initiation of invasion. Our findings may direct melanoma prevention opportunities via targeting specific microenvironments. Interactions of Melanoma Cells with Distal Keratinocytes Trigger Metastasis via Notch Signaling Inhibition of MITF. Levy et al 2015.